A baiting permit is required for any bait site. Baiting permit applications (no fee) are available at any Fish and Game office or online at huntnh.com/licensing/forms.html. Applications for permits to bait wildlife on private property must be signed by the landowner. No bait shall be placed until two copies of the bait permit and map have been submitted to the Wildlife Division at Fish and Game headquarters in Concord. No bait may be placed from April 15 through August 31 (dates inclusive). Bait may not be placed at any site until the baiting season for that species is open. A landowner placing bait on his or her own property does not need to submit a baiting permit or map, but they must meet all the other requirements listed below regarding the use of bait. No person, except a licensed N.H. Hunting Guide, shall have more than 2 active bait sites statewide. A licensed N.H. Hunting Guide shall have no more than 8 active bait sites, 6 for commercial use and up to 2 for personal use. Licensed N.H. Hunting Guides must indicate on the bait permit if the site is for commercial or personal use. Any bear taken off a commercial site must be tagged with a bear guide tag. A licensed guide can only use his/her guide tags on bears taken off commercial bait sites which are under his/her name. No bear taken off a personal site can be tagged with a bear guide tag. A baited area shall not be considered an active bait site when all containers used to hold bait, such as barrels, plastic bags, pails and boxes, and any bait material are completely removed. Applications for baiting permits on private land must be received by the department or postmarked by the first Monday in August for bear, and received by the department or postmarked by the first Monday in October for all other species. It is the permittee’s responsibility to see that two copies of the private landowner bait permit are submitted to the Wildlife Division at Fish and Game headquarters in Concord. Only the person to whom the permit is issued is permitted to place bait at the site. The permittee must post a 3″ x 6″ durable sign at the site with the name and address of the permittee and up to 2 subpermittees. These 3 individuals are the only persons allowed to hunt over the permitted bait site. A licensed N.H. Hunting Guide must post a sign with his or her own name and address, but is not required to post the names of paying clients. The sign must be clearly visible not higher than 6 feet off the ground. If no subpermittees are identified on the sign, they may not be included at a later date. Once the sign has been posted, it may not be altered at a later date. No person other than the permittee authorized to place bait at a site shall remove, alter, or destroy said sign. Bait may not be placed less than 300 feet from a dwelling, public roadway, pathway, or trail. From the close of the bear baiting season through December 15, baiting for coyote shall be restricted to the use of meat, animal parts, carrion, or fish. No person shall place bait in public waters or on ice-covered public waters. It is illegal to bait for turkey, moose, or migratory waterfowl. Permits expire at the end of the calendar year, unless an earlier date has been specified on the permit form, or the season has ended for the species identified on the baiting permit. When requested by a CO, a permittee or an applicant to bait must accompany the officer to the proposed or existing site. A baiting permit is required for any bait site on State-owned or State-managed lands, including White Mountain National Forest. Applications for baiting permits on state-owned or state-managed lands must be received by the department or postmarked between the first Monday in June and the first Monday in August for deer and bear. Applicants may apply beginning December 1 for permits to bait coyote for the year following. Permit applications for all other species shall be accepted at any time. Applications must be filled out completely, and must include a topographic map and directions to the bait site to be considered. Baiting permits are issued on a first-come, first-served basis, except permits for the Connecticut Lakes Headwaters Forest, which are issued by lottery (visit wildnh.com/hunting/baiting-wildlife.html for more information). One copy of the bait permit application shall be submitted to the Law Enforcement Division at Fish and Game headquarters in Concord. No person, including a licensed N.H. Hunting Guide, shall have more than 1 active bait site within an individual trapping unit. Visit huntnh.com for details regarding trapping units. Non-edible or non-digestible materials shall not be used as bait. A total of 40 active bear bait sites will be allowed on the Connecticut Lakes Headwaters property in Pittsburg, NH. Also see Tree stands/Blinds below. No person, except a licensed N.H. Hunting Guide, shall place bait for the purpose of attracting and taking bear at more than 2 bait sites statewide. No person, except a licensed N.H. Hunting Guide, shall have more than one bait site for bear in the combined area of WMUs A, B, D1, H1, H2, I2, K, L, and M.
No person shall establish, tend, or hunt bear over a bait containing chocolate or any cocoa derivative. White chocolate may be used as bait. No person, except a licensed N.H. Hunting Guide, shall place bait for the purpose of attracting and taking deer at more than 2 bait sites statewide. No person shall place bait for the purpose of attracting and taking deer prior to the opening of the deer baiting season. Persons holding a Disabled Veteran License or Paraplegic License may bait deer from September 15 through December 15, statewide. If you find a dead deer, bear, moose, or turkey you did not kill, do not tag or move it. Motor vehicle killed wildlife may not be taken without permission of a law enforcement officer. Call Law Enforcement Dispatch at (603) 271-3361. It is illegal to discharge a firearm or shoot with a bow and arrow or crossbow and bolt or a .22 caliber or larger air rifle when used for hunting purposes within 300 feet of a permanently occupied dwelling without permission of the owner or occupant, or from the owner of the land on which the person shooting the firearm, air rifle, bow and arrow, or crossbow and bolt is situated. A firearm may not be discharged within 300 feet of any commercial, educational or medical building, or outdoor public gathering place. Firearms may not be discharged within the compact area of any town or city (any contiguous area containing 6 or more buildings used as part time or permanent dwellings where each is within 300 feet of one of the other buildings, plus a 300 foot wide perimeter around all of the buildings). It is unlawful to discharge a firearm, air rifle, bow and arrow, or crossbow and bolt within 15 feet of the traveled portion of, or across any class I through V highway, or from or across the following public highways (including the rights of way): I-93, I-89, I-95, 293, 393, Rte. 202/9 (from Rte. 114 in Henniker to Rte. 31 in Hillsboro), Rte. 16 (from I-95 to Milton/Middleton town line), Rte. 3/F.E. Everett Turnpike (from Mass. line to Rte. 101 Bedford), or Rte. 101 (from Bedford town line to Rte. 1 Hampton). Additional regulations apply to licensed New Hampshire Hunting Guides. Contact the Law Enforcement Division at (603) 271-3127. Interstate transportation of wildlife taken, possessed, transported, or sold in violation of a state law is a violation of federal law. The penalty can be up to $250,000 and 5 years in prison. Volunteer leashed dog trackers are private citizens who can help track and recover wounded deer, moose, and bear. They are licensed by the N.H. Fish and Game Department for this activity, which may take place at night. Give them a call, they can help. Visit huntnh.com for a list of licensed leashed dog trackers. Use of OHRVs (ATV, trail bike, UTV) requires written landowner permission unless on a sanctioned ATV trail and must be registered when operating off your own property. No person shall carry on an OHRV, or a trailer towed by the same, any firearm unless it is unloaded. This does not apply to pistols or revolvers carried pursuant to RSA 159. On State-owned and State-managed lands, permanent stands are illegal. Portable stands or blinds may only be erected between August 1 and January 31, and must be removed by January 31. 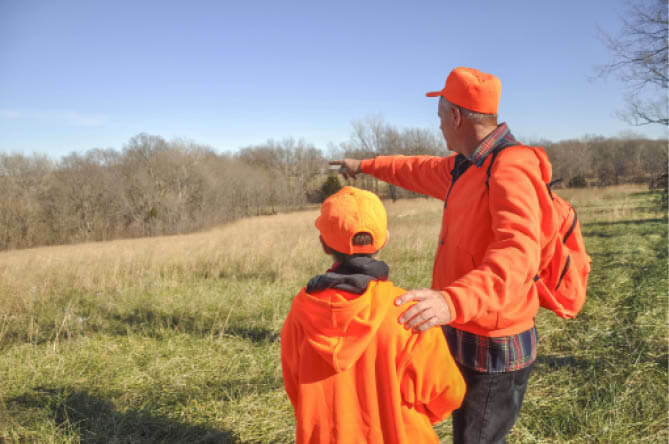 See Towns with Special Deer Hunting Rules for restrictions. This National Wildlife Refuge, located in Greenfield and Temple, NH, is CLOSED to all hunting. Negligently shoot, wound, or kill a human being while hunting, or abandon a wounded or killed human being. Negligently discharge a firearm or cause death, injury, or damage to domestic animals or property while hunting. Shoot a domestic dog in pursuit of wildlife. Possess a firearm with ammunition, bow and arrow, or crossbow and bolt while attempting to locate or illuminate wild animals at night at any time of the year, except while coyote night hunting from January 1–March 31, raccoon hunting (see Furbearer Hunting), or checking traps at night (see Furbearer Trapping). Illuminate wild animals from Sept. 1 through Dec. 31. Moose, however, may be illuminated between 9 a.m. and 11 p.m. from Sept. 1 through the second Monday of October in Coos County on Class I, II, and III state highways, and, with city or town permission, on Class IV, V, and VI town roads. Take wildlife by the use of a spring gun or set gun. Use an unmanned aerial vehicle, such as a drone, to attempt to locate, surveil, or aid or assist in the taking of wildlife. Use “smart rifles” while hunting wildlife (firearms that are electronically controlled, electronically assisted, or have a computer-linked trigger that aids the shooter in tracking an animal, or assists in accuracy regarding the placement and timing of the shot). Use live-action game cameras while attempting to locate, surveil, aid, or assist in taking or take any game animal or furbearing animal during the same calendar day while the season is open (cameras that send an electronic message or picture to a handheld device or computer when sensors are triggered by wildlife). Establish, tend, or hunt bear over a bait containing chocolate or any cocoa derivative (see above). Hunt from inside of, or upon, any type of motorized vehicle, including aircraft, motor vehicle, snowmobile, or OHRV. Hunt from a boat or canoe before all movement from mechanical power has stopped. Carry a loaded firearm or cocked crossbow; A firearm is considered loaded if a round or projectile in the chamber is fully dischargeable by pulling the trigger, while the firearm or crossbow is in any type of motorized vehicle, while moving; a muzzleloader is considered unloaded if the ignition source (i.e., primer cap or flint or primer powder) is removed from the firearm. Enter posted land without permission of the owner or fail to leave when requested. Willfully tear down, obstruct, or leave open any fence, gate, or bar belonging to, or enclosing land of, another person, or remove or deface any posted sign or property. Hunt with a fully automatic firearm. It is also illegal to hunt with a semi-automatic rifle with a clip or magazine holding more than five cartridges (except rimfire rifles and pistols). Use full-jacketed metal case bullets. Use telemetry equipment from ½ hour before sunrise through ½ hour after sunset to locate trail or tree hounds while in a motorized vehicle or within 300 feet (as measured from the center of the traveled portion) of any public highway or any private road open to public use. Buy, sell, or offer for sale a deer, bear, moose, or any part thereof, other than the head, hide, or feet. Possess a deer, bear, moose, or turkey that hasn’t been properly tagged. Possess a detached deer, bear, moose, or turkey tag. Upon killing a deer, bear, moose, or turkey, the tag shall be immediately filled out and attached. Assist another in taking a deer or bear after you have taken one, unless you possess a valid unused tag or are accompanying a minor. Tag, steal, take, or carry away any game belonging to another person. Dispatch a wounded deer, bear, moose, turkey, or other game animal that is not permitted to be taken at night with a firearm, unless you are a licensed dog tracker. Anyone found guilty of violating any Fish and Game hunting regulation or trespass may lose his/her hunting privileges for a minimum of one year. A NH hunting license suspension could result in a hunting license suspension in other states. Any person hunting with a firearm or bow and arrow during New Hampshire hunting seasons, except for a person legally hunting waterfowl, should wear a hat, vest or other suitable article of clothing of material in the color of hunter orange visible from all sides at a minimum distance of 200 feet. Be sure you positively identify your target—and beyond—before you shoot.